» Alcohol Ads on Billboards: Marketing to Youth? 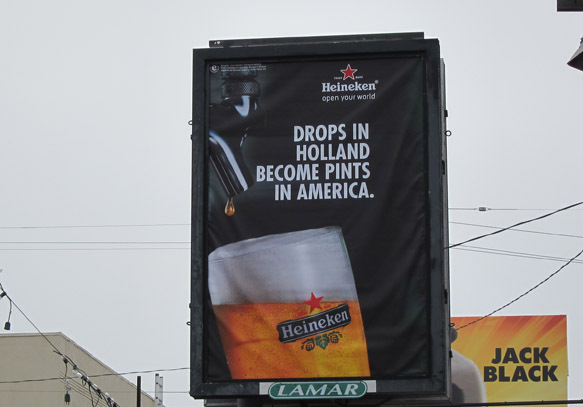 Other research has confirmed this link between advertising and increased youth drinking. 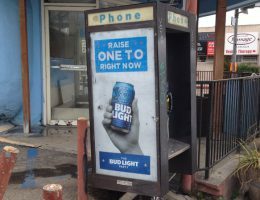 Yet billboard companies continue to place prominent ads for alcohol in proximity to places where young people congregate. A case in point is the Outfront Media billboard pictured above, which is just a door away from Venice Arts, a community arts center for low-income youth on Lincoln Blvd. in Venice. Was placement of that ad for Coors Light where it would be seen by many young people under the drinking age just a coincidence? Or deliberate? Less than a block away are a public phone with a Bud Light ad and a doubled-sided Lamar Advertising billboard that has displayed at least four alcohol ads in the past several years. More coincidence? As pointed out in an earlier article, this stretch of Lincoln Blvd. is a daily route for students at Animo Venice Charter High school who arrive by bus from other parts of the city and walk the street to and from the campus. Which means more exposure for the alcohol advertising, intended or not. 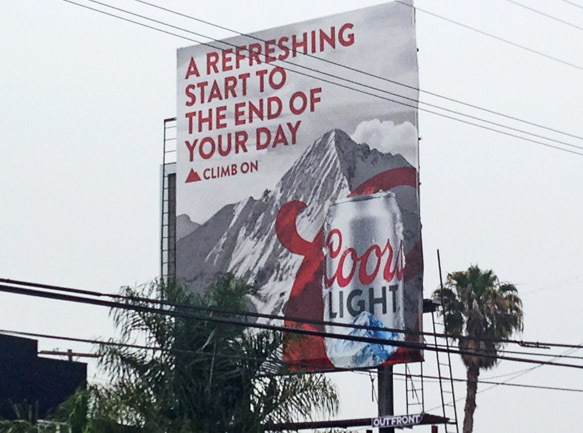 The Outfront Media billboard now displaying the Coors Light Ad also appears to be have been significantly enlarged in violation of the city’s sign code. According to city records, the sign was permitted in 1969 with two 12 ft. By 25 ft. faces. But inspection records show that the face with the alcohol ad is 26 ft. By 25 ft., or more than 100 per cent larger. The Lamar Advertising billboard may also violate a sign code section prohibiting billboards from extending over a public sidewalk.